My eyes tired from a day spent looking into the sun, I drowsed in a Land Rover beside a waterhole in Chobe National Park. Only a few yards from our vehicle, a single-cylinder pump drew from the water table beneath the sands and sent spurts through a pipe to a square concrete trough. The bachelor elephants of Savuti congregated around the trough as they waited for spring rains and the return of female breeding herds. The steady sound of the pump, chugga-sputter, chugga-sputter, chugga-sputter, lulled my eyes closed. They opened, closed, opened half-lidded, closed again. “Here he comes,” someone whispered and my eyes flicked open as a huge bull strolled past. I picked up my camera. His enormous tusk splayed out almost sideways. I focused on his great head, nodding downward with each step, as he trudged past. A thirsty pilgrim in a parched land, his trek to water was nearly finished. The clicking and whirring of our cameras didn’t alter his gait. Through the viewfinder I marveled at his tusk. It was easily four feet long, stained and chipped on its end. Because of the growth pattern of his tusks – out, rather than down and up – he seemed a much wider elephant than he really was. Mid-drink, he curled his trunk into his mouth; head tilted back, eyes closed. 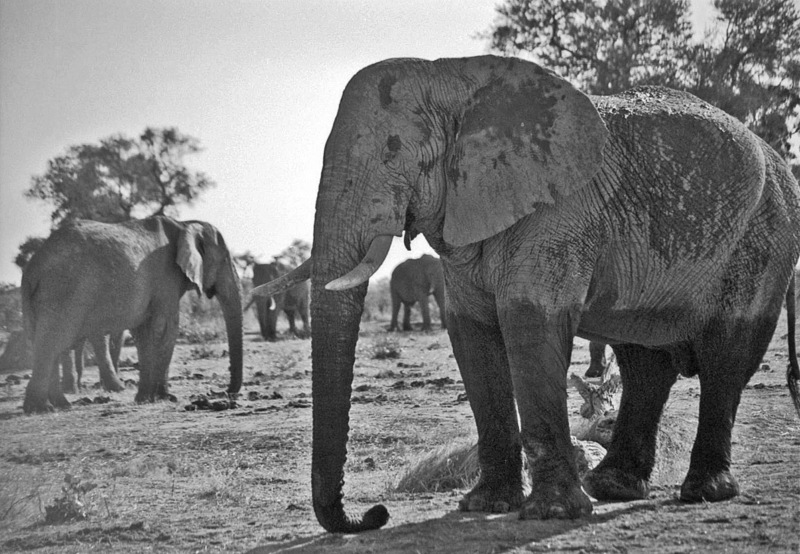 Extending his trunk into the waterhole, he blew bubbles before curling his trunk again and again to hose several gallons at a time down his throat. With each swallow went samplings from all the animals that drank here – zebra, wildebeest, warthog, ostrich, hyena and the occasional furtive flavor of lion. I tried to imagine the bouquet garni of the waterhole and how its myriad fragrances might seep into the crevices of an elephant’s mind, form pools of scent they recognize, year after year, the liquid memory of Africa. Perhaps that old bull was memorizing the stories in that trough, paragraphs of taste and smell, twists of plot and character and fate. He retraced his steps to where we were parked, and stopped close by. His skin was the color of seasoned cast iron. The waterline on his body rose just past his belly. Spatters of mud stained his ears and back. After several long minutes, his eyelids drooped and his mouth slackened. Under the hot sun he fell asleep, lulled perhaps by the narcotic of a long, slow drink. 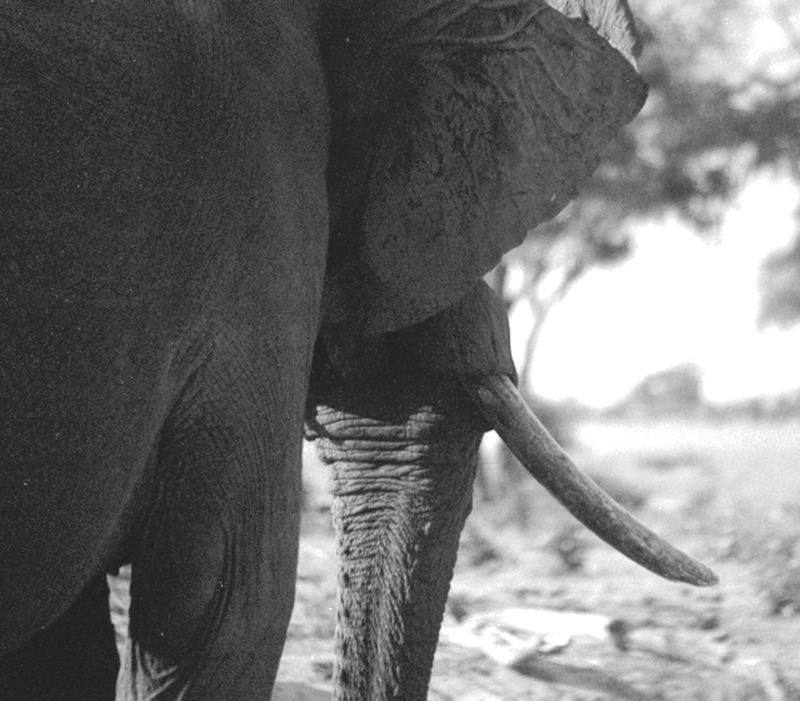 The tip of his trunk coiled like a magic rope on the ground. He slept with his weight on three legs, resting a hind leg, occasionally rocking back on it as if he dreamed of his trek. Drool from his trunk slowly seeped into the sand. I matched my breathing with his, and drowsed once again, sedated by the sun. The giant beside us rumbled soft snores in his sleep. Other elephants shuffled by quietly on their way to and from the waterhole, as if they didn’t want to wake us. You cannot imagine how I have felt so peaceful and full of wonder, and the memories that have been evoked from this story. I’m so grateful for your generous words and hope to see the memories they evoke on your page. Poetry in the guise of prose. A love poem … a motion picture of an extraordinary universe that I can observe through your eyes. Thank you for this. Beautiful. Charlie, how are you? Thank you for your wonderful words. I’m doing fine. Thanks for asking. I passed along you’re your post with a note: “If Cheryl wrote about cow dung, I’d want to read it.” Working on next issue of The Hummingbird Review, theme: Bios and Memoirs. Also writing articles for a national ostomy magazine … my newest passion … no, I don’t have one … but a friend does. I do write about elephant dung……..:-) amazing how our passions generate from what happens in our lives.